As the Kop bellowed out their famous tunes ahead of Liverpool’s Europa League tussle with Manchester United, my colleague, Michael Henry, and I could do not much more than look at each other in disbelief. We can always say we were there at the first ever European match-up between these two giants of English football. 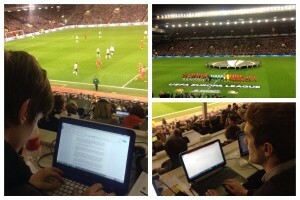 Sure, I had been to Anfield many times before as I work at the ground. This time, however, I wouldn’t be scrubbing pots as a kitchen porter… I was covering the match for JMU Journalism, and gaining an insight to this fast-paced industry along the way. Anfield is renowned for its many big European nights, but this wasn’t the Champions League knock-outs or even a group game. This was the unloved Europa League that top teams desperately try to avoid, but there was no mistaking the size of this particular occasion. Add to that, the team that I support and everyone else in the city loves to hate – Manchester United – were in town. There was a real buzz about the stadium even two hours before the kick-off. As Michael and I squeezed our way into the press room before the game we were even star-struck by seeing former Wigan manager, Paul Jewell. Then it got even better. Michael as an Evertonian and I as an undercover Manc couldn’t contain our excitement as we saw Louis Saha, who starred for both clubs. 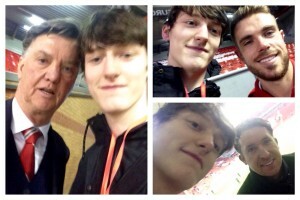 We had a pleasant chat with the Frenchman then got down to business in the stand after a customary selfie or two. The Kop in full cry must be a scary prospect for opposing players. United just couldn’t get into the game in the opening stages and after Daniel Sturridge put the hosts one up from the spot, the fans got even louder, which was some feat considering they had already generated more decibels than I’ve ever encountered. I couldn’t help but be nervous as I tried to toggle Twitter posts, worried about keeping my wifi connection live, plus writing this piece along with taking photos and videos. I appreciate the job that a sports journalist has, from the first pre-game press conference all the way to scrambling to perfect their match reports on the final whistle. The advice I’d been given beforehand to have “ice in my veins not stars in my eyes” started to become very relevant. Sitting two rows behind Reds legend Robbie Fowler and ITV commentator Clive Tyldsley, the voice of European football, alongside my new mate Louis Saha, was a real insight into the industry. People I have watched, listened to and talked about for many years were here, and I was working slap bang in the middle of them. When Roberto Firmino added to Liverpool’s lead to make it 2-0 in the second half, the place erupted. The Kop was bouncing and the fans behind us let off a red flare. Love them or loathe them, the Anfield faithful had really put on a show. I was inundated with messages from my friends responding to my tweets, saying how unbelievable my night looked. Although it was just that, there was work to be done. The press area was congested and the coldness bit hard, but it was all part of a truly eye-opening occasion. To see the love for their team that fans of these two North West behemoths have filled me with warmth on a chilly night. I found myself not overly sad at United’s loss, just plainly grateful for the opportunity. Even for a follower of the beaten side, this was an epic experience.